Being able to measure people’s quality of life is fundamental when assessing the progress of societies. There is now widespread acknowledgement that measuring subjective well-being is an essential part of measuring quality of life alongside other social and economic dimensions. 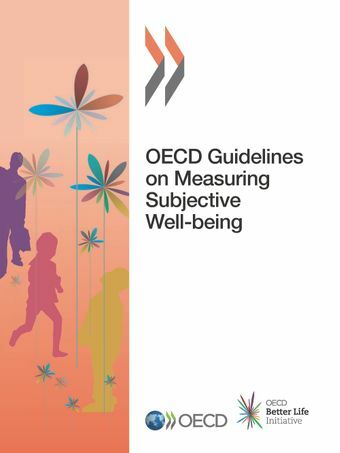 As a first step to improving the measures of quality of life, the OECD has produced Guidelines which provide advice on the collection and use of measures of subjective well-being. These Guidelines have been produced as part of the OECD Better Life Initiative, a pioneering project launched in 2011, with the objective to measure society’s progress across eleven domains of well-being, ranging from jobs, health and housing, through to civic engagement and the environment.These Guidelines represent the first attempt to provide international recommendations on collecting, publishing, and analysing subjective well-being data. They provide guidance on collecting information on people's evaluations and experiences of life, as well as on collecting “eudaimonic” measures of psychological well-being. The Guidelines also outline why measures of subjective well-being are relevant for monitoring and policy making, and why national statistical agencies have a critical role to play in enhancing the usefulness of existing measures. They identify the best approaches for measuring, in a reliable and consistent way, the various dimensions of subjective well-being, and provide guidance for reporting on such measures. The Guidelines also include a number of prototype survey modules on subjective well-being that national and international agencies can use in their surveys.